It’s bike planting season again with Friends of Trees! Join us on your bike to plant trees in this uniquely-Northwest way! Join a bicycle-powered tree planting crew and plant trees the greenest way possible. No need to bring any tools – we’ll supply all the gear and gloves. Just bring your bike and helmet and dress for the weather. 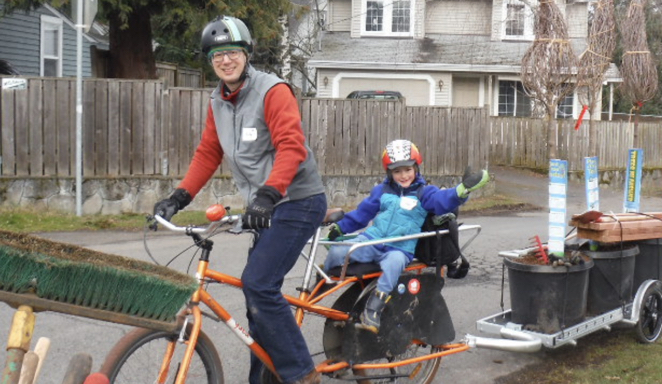 We’ll load up bike trailers with tools and trees and bike to a few homes in the neighborhood to plant trees. Don’t have a trailer? Feel free to borrow one or just bike along and help plant. Enjoy a complimentary hot lunch afterward! Arrive at 8:30 – 8:45am to be registered to a bike crew. Grab coffee and breakfast treats, and then help load trees and tools onto bike trailers — and tally ho — we’re off to plant trees by bike!